This recipe will make 1 doz standard cupcakes. It is easily doubled to yield an 8” round cake, or 1 bundt cake. Preheat oven to 350 degrees F. Line a cupcake tin with paper cupcake liners. Or if doubling to make a cake or bundt cake, spray the pan very well with non-stick cooking spray. Bring stout and butter to a simmer in a heavy medium saucepan over medium heat. Add cocoa powder and whisk until mixture is smooth. Remove from heat and cool slightly. Whisk flour, sugar, baking powder, and salt in a bowl to blend, and set aside. In another large bowl, whisk the egg and sour cream to blend. Add the stout-chocolate mixture to egg mixture and beat just to combine. Add flour mixture and mix with a rubber spatula, folding batter until completely combined. Scoop batter into prepared cupcake tin. Bake 17 to 19 minutes on middle rack of oven. Cupcakes should spring back when touched lightly in the middle. Cool in pan a few minutes before removing from tin and cooling completely on cooling rack. 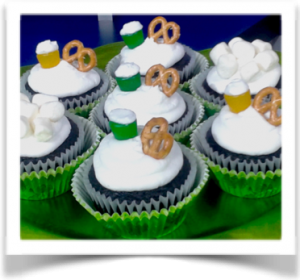 Top with your favorite with buttercream and decorate with a mini pretzel or mini marshmallows. NOTE: If making a cake, bake for 30 to 35 minutes. Allow to cool completely before removing from pan or it may stick. Top with a chocolate ganache drizzle.